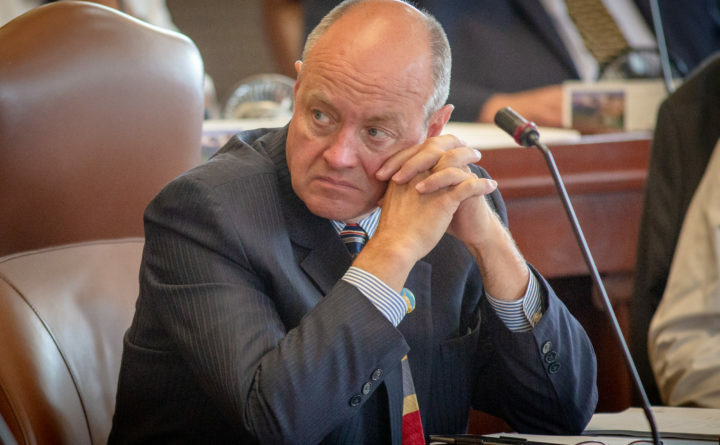 State Sen. Andre E. Cushing III, R-Newport, who was forced to step down from a leadership role due to election ethics violations, is running for a seat on the Penobscot County Commission. He is one of three candidates seeking to fill the seat left vacant by the death last month of longtime Commissioner Thomas J. Davis Jr. of Kenduskeag, according to the Maine Secretary of State’s Office. Davis represented District 2, the southern and western sections of Penobscot County, for more than three decades. Cushing, 59, is completing his third term in the Senate. He is not seeking re-election to that position. The other candidates are Democrat Donovan E. Todd III, age unknown, of Etna and Libertarian Donald W. McCann, 48, of Corinth. Todd served as Maine state executive director for the USDA’s Farm Service Agency during the Obama administration, according to the Bangor Daily News archives. McCann is the chairman of the Penobscot County Libertarian Party, according to his campaign Facebook page. Cushing announced in February that he would not seek re-election to his Senate seat after the Maine Ethics Commission last year found he had violated election regulations. In August 2017, the commission levied $9,000 in fines against a political committee run by Cushing for 11 finance reports that were filed late between 2014 and 2016. The probe was launched in October 2016 into Cushing’s campaign finance activities after his sister accused him in a civil lawsuit and a complaint to the commission that alleged he misused family business funds and commingled some of it with campaign funds. The lawsuit is still pending in Penobscot County Superior Court.